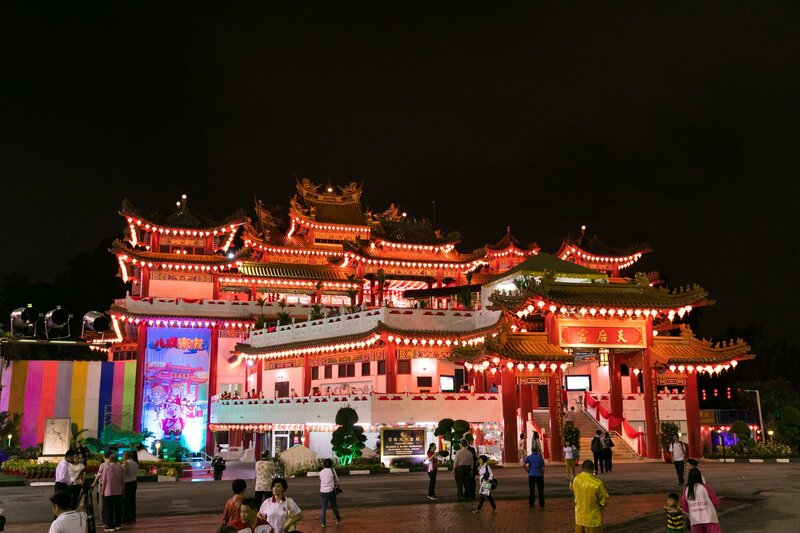 Thean Hou Temple is a 6-tiered temple to the Chinese sea goddess Mazu located in Kuala Lumpur,Malaysia. It is located on 1.67 acres (6,758 m2) of land atop Robson Heights on Lorong Bellamy, overlooking Jalan Syed Putra. It was completed in 1987 and officially opened in 1989. 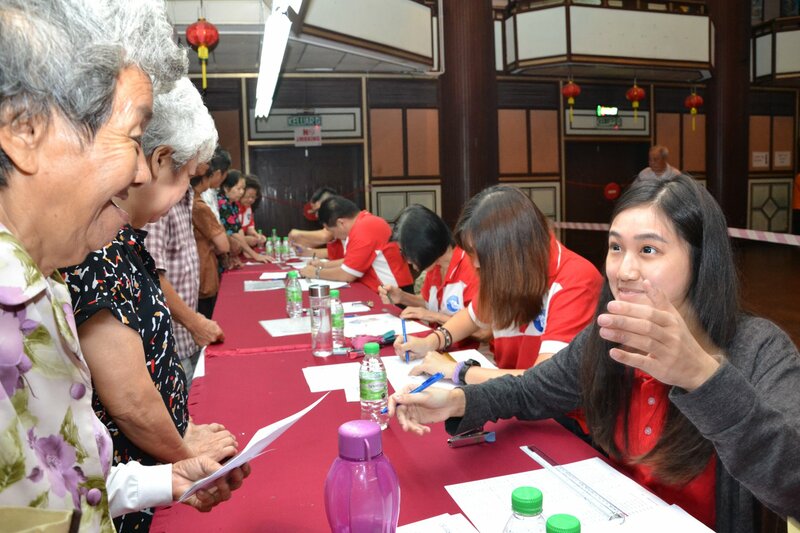 The temple was built by Hainanese living in Malaysia and the property belongs to and is run by the Selangor & Federal Territory Hainan Association. This syncretic temple with elements of Buddhism,Taosim and Confuciaism is a grandiose structure and represents a successful combination of modern architectural techniques and authentic traditional design featuring imposing pillars, spectacular roofs, ornate carvings and intricate embellishments. Its grand architecture has made it a popular tourist destination. The front entrance of the temple features a multi-arched gateway with red pillars, the colour symbolic of prosperity and good fortune. Souvenir stalls and a canteen are found on the 1st level. The 2nd level houses the multi-purpose hall while offices are located on the 3rd level. The 4th level has 3 tiers and the prayer hall is located here. The prayer hall houses 3 altars, each with a sculpture of one deity or goddess. As one enters the prayer hall, the altar on the right is dedicated to Guan Yin, the Goddess of Mercy. Tian Hou is in the centre while Shui Wei Sheng Niang (the Goddess of the Waterfront) is at the left. In the middle of the hall and between the altars are two pairs of Kau Cim oracles that can be used by visitors. Despite the dedication to Tian Hou, worship of Guan Yin is a recurrent theme at the Thean Hou Temple. In addition to her altar in the prayer hall, there is also a smaller statue of Guan Yin to the right of the hall, set amongst rocks and falling water. Here one can kneel and receive a blessing of water from the statue. Outside the temple at the entrance to the grounds, there is a larger statue, similarly set amongst rocks and falling water. Other features include a Chinese Medicinal Herbs Garden, a Wishing Well as well as a Tortoise Pond. Finally there is a large statue of the goddess opposite the temple, along with a collection of other large statues that include representations of the twelve animals of Chinese astrology. 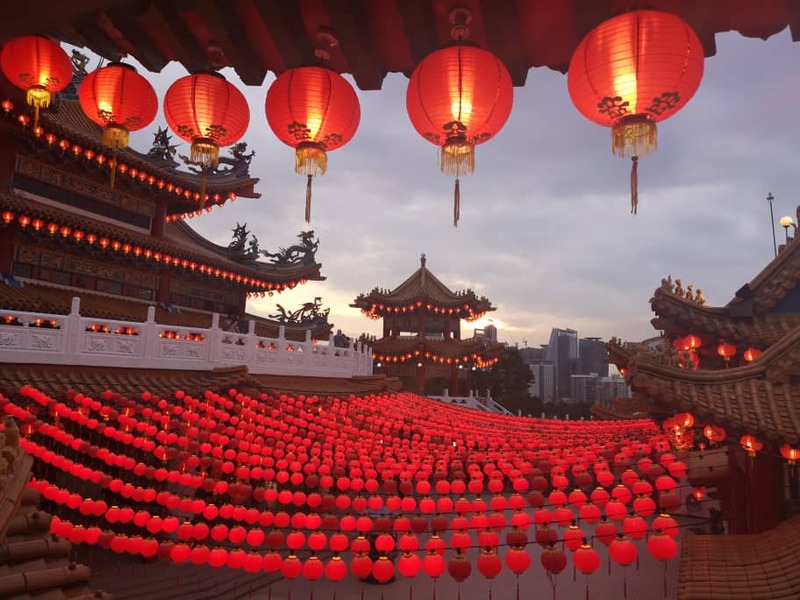 Activities such as the grand birthday celebrations for Goddess Tian Hou, Goddess Kuan Yin and the Goddess of the Waterfront are conducted at Thean Hou. Buddhist activities include Dharma Prayers and Wesak Day celebrations. 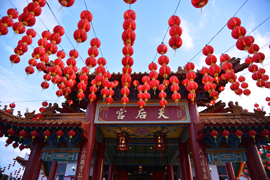 Cultural activities include the annual Mooncake Festival during the eighth lunar month and the Chinese New Year celebration.